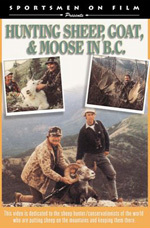 Hunting Video DVD - Hunting Sheep, Goat & Moose in B.C. Safari through British Columbia starting with a hunt for Canada Moose in Northern B.C. with Stone Mountain Safaris, Ken Wilson packs into moose country with his guide, Marty Kjos, and they share several campfires before bagging a big Bull. A Sportsmen on Film DVD production. 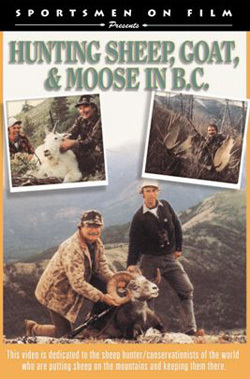 Safari through British Columbia starting with a hunt for Canada Moose in Northern B.C. with Stone Mountain Safaris, Ken Wilson packs into moose country with his guide, Marty Kjos, and they share several campfires before bagging a big Bull. Then Ken reviews the film of Tom Carmody's successful Stone Sheep hunt with outfitter Gary Moore where Tom picks out the biggest Ram in a group of six and rolls it down a shale mountainside with one shot. Finally, Ken flies into Prince George and travels to the southern end of the Finley Mountains in Central B.C. where he packs in for a Stone Sheep and Mountain Goat hunt with outfitter-guide Charlie Stricker. They hunt Goat, first, and pass up a 10" Nanny before dropping a 9' Billy in a spectacular sequence. Then they backpack for Sheep and look over a lot of Rams before shooting one "on top of the world."